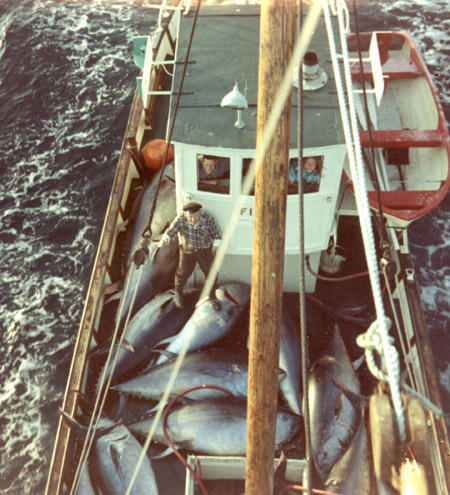 Between 1949 and 1950 the number of specialist bluefin tuna fishing boats in Norway increased from 43 to 200, with Norwegian catches eventually exceeding 10,000 tonnes per year. 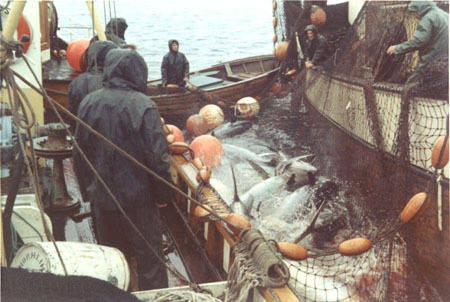 This hunt for bluefin tuna became an important fishery in Norway. By the end of the 1960’s, bluefin tuna had almost completely disappeared from the waters around Norway. On this page you will find some photos showing vessels in action in the 1970’s. By this time only old fish migrated to the Norwegian coast and the shoals were fewer and smaller. By 1986, the stock had collapsed and the fishery was closed. 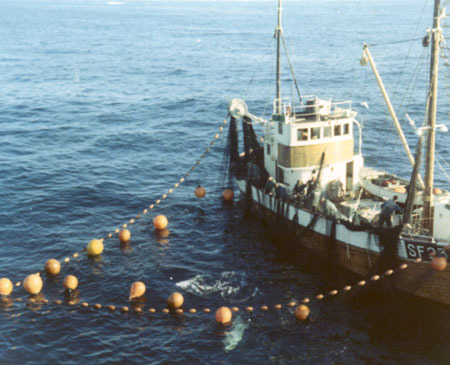 The Norwegian seiner «Frøyabuen» with bluefin tuna in the seine in 1971. The seine is hauled and the tuna is trapped. 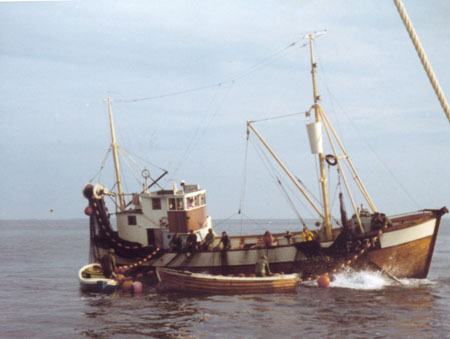 The Norwegian seiner «Vågly» in 1970. A good day on the fishing grounds off the coast of Norway. The vessel «Flid» (in the background) is taking the second catch of bluefin tuna this day. Photo from 1971. The seiner «Basholm» with a nice catch of tuna. An other vessel comes along to take care of the catch. The tuna has to swim in order to get enough oxygen. It will die in few minutes when it is trapped like this. When the tuna is calm (almost unconscious), they will be taken out of the seine. This vessel operated as a fish carrier. It was one of many vessels that transported the bluefin tuna from the fishing grounds. The photo is taken in 1971. Some short film of this fishery can bee seen on this page. Kystbloggen postet denne artikkelen under In English	på lørdag, september 22nd, 2007 at 17:46	Du kan følge med på responsen til denne gjennom RSS 2.0 feed. Both comments and pings are currently closed. Vis reaksjoner fra Technorati. Denne artikkelen har 6 comments så langt! Dette er fantastisk! Hadde aldri hørt om dette fisket før så takk for informasjonen. Hvordan står det til med bestanden i dag? (Svarer på engelsk ettersom det kan være nyttig for dem som finner, og leser, innlegget). 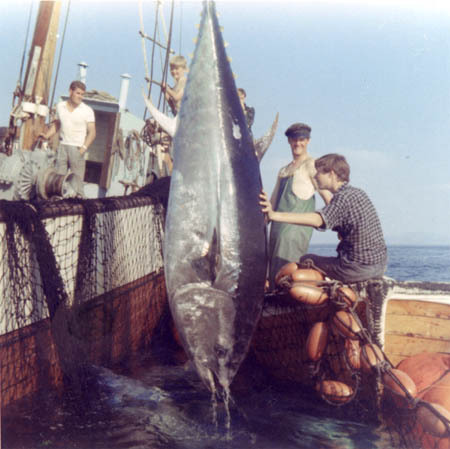 Only one catch of bluefin tuna has been taken since 1986. 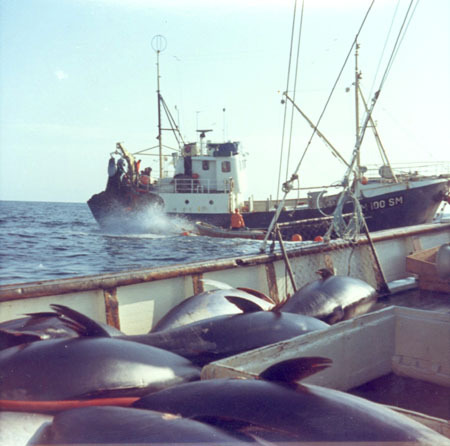 In 1999 the vessel «Gould Dollar» from Sogn og Fjordane caught 18 bluefin tunas. Norway has now a quota of 100 tons, but no one has seen – or caught – tuna the last years. It may take decades to rebuild the stock. My father spent his summers transporting and gutting tuna. I was just a child back then, but I remember these powerful fishes lying side by side on the piers. The last photo shows my grandfather on deck. Thanks for the info. Hope they will come back some day, but I guess it will be hard to rebuild the stock with the massive tuna fisheries all over the world. Great blog by the way! Put it in my RSS reader.